Caryn, I so heart you right now for posting those pics!!!! I got all dorky fan girl excited, even before clicking the links. I was thinking to myself, "No... she didn't... she DID! She posted Eclipse Robward pics!!!" Exciting stuff, I don't care how far away or brightly lit the shot is. Sandy, I'm glad I'm not alone in my disappointment with Dakota's makeup. It's just too much. I think the red eyes make her look evil enough without needing gobs of eyeliner. Ash, I saw the pics of all the Volturi members. The clothes they put on Dakota just don't go with the rest of her appearance. I just hope (and am pretty sure) that she'll pull off a great performance. And you're so right about Demetri. I was like, um... THAT'S the big intimidating guard?? NM soundtrack - heard of Death Cab, don't really have an opinion about them being on it. Will still totally buy it though. I listened to my Twilight soundtrack pretty much everyday from the day it was released until I saw Twilight at the midnight premiere. I liked knowing all the songs already when I heard them in the movie. I'm sure I'll do the same thing this time. Ashley - I think Tattward should come with a warning for a lot of things. He is just too much for a girl I have two chapters left of what's out now. Diane - I don't watch Supernatural. I don't think we have it in Norway. I felt like a complete perv when I googled the one in ch 15 yesterday..
Jen - I have never heard of the band. But I'll definitely buy the soundtrack for NM. I usually don't buy soundtracks, but I did for Twilight. Mandy - I almost felt sick when I saw Rob twisting his fingers backwards like that. I really don't like it when people does things with their hands. (that did not come out right, but you know what I mean ). I'm not fond of Jane's makeup. I always pictured her a bit more boyish looking, and very innocent. But I guess you're right, Erika. We won't see it as much on the big screen. I love the eyes. I have to get back to work. Have a good night/day! I went and saw District 9 tonight, and it was bloody awesome. Good on Peter Jackson. Kiwi Pride. ANYWHO. But they played the NEW MOON FREAKIN' TRAILER b4 it. You can not imagine how loud I squee'd inside my head. The wolf looked really cool on the big screen. And since District 9 is R16 here, there were no stupid little over excited tweens and whatnot. But there were some chicks down my row that got a bit hot and flustered by the shirtless Taylor, and was like "wait.. hes gunna turn into a wolf"
And some dudes were all amazed by the wolf. So me thinks NM will attract a lot of older guys. + So I see they've released the official Volturi pics. Thank you. Thank you. I really can't take credit. Now you all see just why I love Ang (AaT) so much... we were literally mid edit of a part of the next chapter and I see.... WAIT!!! HOLY SHIZA!!!! LOOK WHO I FOUND!!!! And then, gods bless YIM for the way they do photolinks, cause up pops...Robward Cullenson!!!! OH MY ROBWARD!!!! I seriously heart that woman. And, of course, the first people I had to share them with were my fellow Summer House addicts. I am so totally over all of the criticism people have for what's emerged from New Moon thus far. It's NOT going to be word-for-word from the book, nor is it going to look the same as I pictured it in my head. Save word-for-word literal interpretations of books for boring Lifetime movies, in my opinion. Personally, I am just going to sit back and be prepared for an extremely exciting and dramatic representation of New Moon. I am going to enjoy every minute of it. And I think Dakota looks great. I am not going to root through my memory of what SM "said" she looked like, and complain if CW doesn't represent that exactly how it's written. That's what he was hired for - his vision and his creativity. Not to translate the words on paper into a visual replica - how boring that would be. He's no Lifetime director, thank god. My mind is open and desperately thirsty for November 20th - and I HOPE that there are things in it that take me by surprise, or force me to look at things a different way. That's what's exciting for me about seeing my favorite books on the screen. In my mind, I already *know* how the story goes, and a little of CW's creative license won't change that. It's all good. Jadey - so District 9 was good, huh? Maybe I'll see that this weekend. I loved the concept - it's true that movies usually represent aliens as "wanting to come and take over our planet"...as our enemies. I liked how District 9 addressed that. Thanks for the review! Apparently my post about not having internet didn't go through. (I had used my friend's computer). Oh well. Got it back now, so that's all that matters. I missed you all for the 2 days I've been gone. Lol. Bad words - Perhaps the Mods would be nice enough to give us a list of words that are not acceptable and alternatives for those words? Then maybe we won't get yelled at anymore. Jackson's tat - *THUD* I've seen that before, but not that big. Holy crap. Piercings - I have one in each ear. I'm lame. Unicorn shirt - Julie, I would so buy that shirt if I wasn't a fatty. Lol. Caryn's siggie is completely fabu! Love it love it love it. Julie is the awesomest. Since summer is ending, I vote Halfway House. Twilight Venom - It looks awesome, but the description is all kinds of whack. I might buy it. I know Ashley already posted it, but why can't we get this here? No fair. NM soundtrack - I will buy it regaurdless of who is on it. Listening to it will remind me of the movie and the parts that happened when certain songs played. (Just now read what Erika said. She said it better.) No KOL really bums me out though. Boo! We can still hope for Eclipse or BD, right? Death Cab For Cutie - I've heard of them before. I Will Follow You Into The Dark was in the movie The Invisible. Loved it. Don't really have an opinion on the band though. I don't know anything about them. I've seen the video for one song and only just heard IWFYITD. That's about it. NM/Jane pic - Yeah um...I only saw that Jane had red eyes and then I couldn't focus on anything because Robward was behind her. I swear that man takes up waaaaaaaaay too much of my attention. I'm gonna have to try to look at Jane again. I like how Dakota went from having Alice's power in Push to being Jane. Haha. 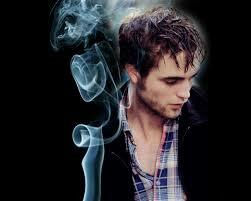 Eclipse Robward pics - *Kristiner will be back to share her thoughts once she is revived* Sorry, where was I? Good Lord. Death Cab - that's what else I was going to talk about. I like them - I have a friend who is a bit obsessed with punk because of her bro - he's a fabulous drummer, so I know them because of her. Her bro was (is?) in a band called Awesome Car Funmaker that was (is?) on the same record label as Death Cab, so they were thinking they might tour together at some point. Pretty awesome. Diane~ I think I am going to stick with your theory. Yes, Rob does look young and carefree, neither of which really descibe Edward. But, I am going to stick with you that it is a matter of him being just hideously happy to be back with Kristen, and on a Twilight set. Especially one where they seem to have the security somewhat in hand. Well, we haven't heard about him being thrown in front of a runaway craft services truck on the set yet. . And again... Kristen. I just don't think we can underestimate her effect on him. We saw it when they got to the NM set, at the MTVAs, at the TCAs and now on the Eclipse set. I love a happy Rob. Julie – I agree that CW needs to be able to use his creativity and make the story into something that he wants to make. And I am fine with some changes, because the books won't translate perfectly into a movie. But I don't want it to be like Twilight, where I felt that CH took too many liberties/shortcuts and drifted too far from the story. Kristiner – It seems like you were gone more than two days. Welcome back! Diane/Caryn – I agree with you. Rob does look younger and happier than he did during Remember Me. And I think it has a lot to do with the fact that the Eclipse set is much more closed to spectators and he is much more sheltered. I also think he loves hanging out with the cast and crew, and I seriously think that he loves making the Twilight movies. At least I like to think that he does. I just finished the last chapter tonight. So now I am waiting like the rest of you. But I have 17 chapters left of ToV to keep me occupied in the meantime. I listened to Death Cab for Cutie. Thanks Jen, for the links. They were alright. I'm excited to hear the song they're doing for NM. I also like that the soundtrack includes bands that I haven't heard of before. Helps me broaden my music horizon. I finally got a change to talk to my bf. He made it over the mountain in one piece, but he was of course very tired. But now I can relax, knowing that he'll be safe in a cabin for the rest of the weekend. I think I like the makeup. It doesn't seem to be to too much. I also think the outfit looks nice for Edward. I really want to see Kristen as Bella now. Her hair, yes, but also the make up. I hope they don't go back to make her so incredibly pale, like in Twilight. That's it for me, I think. Have a great night!